Two decades ago, the concept of a No Kill community was little more than a dream. Today, it is a reality in many cities and counties nationwide and the numbers continue to grow. And the first step is a decision by a shelter’s leadership: a commitment to reject kill-oriented ways of doing business, to replace a regressive, anachronistic 19th century model of failure with 21st century innovations by implementing the No Kill Equation. No Kill starts as an act of will. Animals enter shelters for a variety of reasons and with a variety of needs, but for over 100 years, the “solution” has been the same: adopt a few and kill the rest. 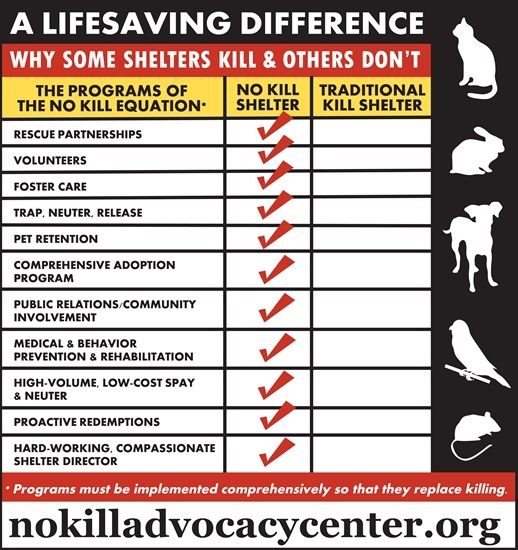 The No Kill Equation provides a humane, life-affirming means of responding to every type of animal entering a shelter, and every type of need those animals might have. Some animals entering shelters are feral cats. At traditional shelters, they are killed, but at a No Kill shelter, they are neutered and released back to their habitats. Some animals entering shelters are motherless puppies and kittens. At traditional shelters, these animals are killed as well. At a No Kill shelter, they are sent into a foster home to provide around-the-clock care until they are eating on their own and old enough to be adopted. Some animals have medical or behavior issues. At a traditional shelter, they are killed. At a No Kill shelter, they are provided with rehabilitative care and then adopted. Whatever the situation, the No Kill Equation provides a lifesaving alternative that replaces killing. While shelter leadership drives the No Kill initiative, it is the community that extends the safety net of care. Unlike traditional shelters—which view members of the public as adversaries and refuse to partner with them as rescuers or volunteers—a No Kill shelter embraces the people in its community. They are the key to success: they volunteer, foster, socialize animals, staff offsite adoption venues and open their hearts, homes and wallets to the animals in need. The public is at the center of every successful No Kill shelter in the nation. By working with people, implementing lifesaving programs, and treating each life as precious, a shelter can be transformed. For a description of the programs of the No Kill Equation and how shelters should implement them, click here.